With Battlefield V Chapter 2: Lightning strikes now live, we wanted to provide some insight on the Company Coin accrual at max Career Rank and Tides of War Missions tracking issues, and what we’re doing to resolve them. To echo our previous Letter to the Community, the ongoing Company Coin issue prevents players who achieve the max Career Rank of 50 from accruing Company Coin. This results in players being unable to acquire new items that they want or spec their weapons from the Company and Armory. Additionally, players were previously seeing issues with successfully tracking requirement completions for in-game Tides of War Missions which resulted in not being able to unlock their final reward. As of today, we’ve implemented additional back-end fixes that resolved the Company Coin issue for many of our affected players. However, we know that some players are still not receiving Company Coin, but this should be significantly minimized. For those affected, we are processing a manual batch-job that will resolve the issue. Adding to this, we are still prioritizing the development of a script to retroactively reimburse players who’ve missed out on potential Company Coin. We will continue to update you on our progress with retroactive rewards. 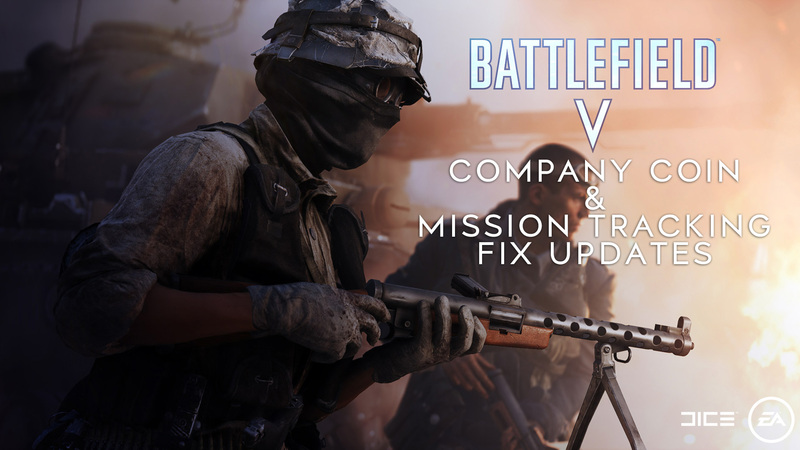 Today’s fixes also resolve the Tides of War Missions tracking issue. You should now be able to successfully track previous and present Mission requirements and completions. However, there is a known complication with the “In My Hands” Special Mission not available for selection after completing the Rank requirement. Fortunately, all you must do is restart Battlefield V to resolve. As always, we appreciate your patience and continued candid feedback. We are committed to fully addressing these issues and continually improving Battlefield V.